Hello everyone! I'm flying to Boston in the morning to begin my US Book Tour for Decorate thanks to Chronicle Books and Anthropologie and I'm very excited and the butterflies I feel are almost as wild inside of me as before my wedding. Funny to say that, but it's true. I'll be blogging from the road as much as possible to share all of my impressions as I go from Boston to Chicago, then I meet Leslie Shewring and we are together in San Francisco and Los Angeles, then I'm alone again and fly to Philadelphia and finally I'll be in New York City! I return back to Germany on September 1st and my heart is pounding in my chest - I'm so excited! I will be on a plane every few days but fortunately I can stay in close touch with all of you via decor8 and with my husband and friends via Skype - he is staying home in Germany while I'm on tour but he's really looking forward to all of my updates and told me last night how proud of me that he is and that I've done so much with my life and now a book tour... which is something I needed to hear because if our family isn't proud of us then it's hard to go forth with a good feeling don't you think? It made me cry when he told me how he felt from his heart -- and the timing was perfect because I've been riding a wave of emotions all week. But now I have a very excited feeling because he can't wait to see how it goes and because my mother called and she is coming to my event in Boston and my friends are going to be there too - so with Boston as my first stop, I think I should feel comfortable and do just fine. Chronicle was clever to send me there first, it's like they knew it would be a great city for me to kick things off in. I feel like Boston will give me a very nice welcome and I really need it because this is fun but I can't deny how anxious I feel! I haven't flown on a long haul flight alone in over ten years so I'm wondering how I'll do. I have lots of reading that I want to catch up on and my trusty iPhone apps to keep me occupied so whoever I sit near I apologize in advance for my Angry Birds obsession. I'm sure the time will go by quickly. If I have time tomorrow when I'm in Boston I'll blog before the weekend to say hello to you again. 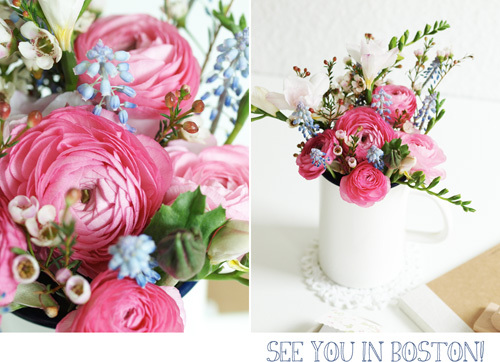 :) Like I said, I am not disappearing for two weeks on decor8... I'm going to share everything as I go so you can be a part of it as much as possible, I know many of you don't live even close to the cities that I'll be in so for you, I'll be sure to take photos and capture as much as I can. I also plan to collect as many business cards as possible so I can share those whom I'm meeting along the way with all of you so you can feel like you are meeting new people, too. I'll also be blogging about products and interesting things that I see along the way, and I have some posts that are totally unrelated to my trip that I'll also be sharing so you'll have a full two weeks on decor8. So! Let the official book tour begin... As my knees shake like it's the first day of school all I can say is that I can't wait to meet those of you who are coming out to my events -- I'm bringing my camera so don't be surprised if you end up on my blog, ha ha! :) You've been warned... :) I have to finish packing and then off to bed I go. Tomorrow is a big day! P.S.S. Have you ever wanted to take a class with Leslie Shewring from A Creative Mint and from decor8's Color Me Pretty? Here's your chance.